Woohoo!!! 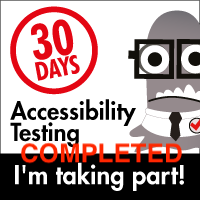 Day 30 completed on March 31! Truth be told, this was a bit much and I have no one to blame but myself for how this turned out. Still, I feel like I learned a lot and covered a lot of ground. Some of it felt familiar but there was quite a bit of new information and perspectives I had a chance to look at and think about how to implement with my team. 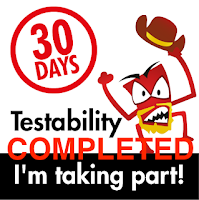 It's time to bring the formal "30 Days of Testability" to a close and to do that, I'm going to review a book that, as I came to the Ask Me Anything post, made me realize that the sudden availability of this book wasn't an accident, as one of the authors of the challenge, Ash Winter, was also one of the writers of this book. How convenient :)! What book did you choose on Day 3 and what did you learn from it? 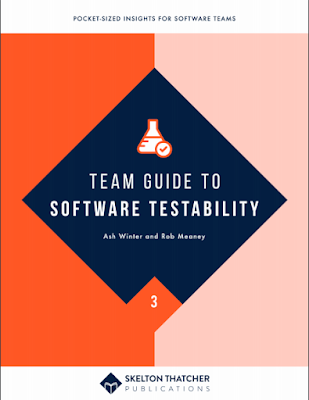 The book I chose was "Team Guide to Software Testability" by Ash Winter and Rob Meaney. well your product fits your customer’s needs." Testability goes hand in hand with predictability. When an application responds in a predictable manner, we are able to interact with better certainty that we will see the results we expect. That, in turn, helps inform the testability or lack thereof of our applications. Testability Mapping allows users and teams to get a better feel for the areas of their application that are working well and those that still need to be worked on. When we have a low understanding of the underlying testability architecture, we often struggle with anything approaching effective testing. To help address that, it's important to take stock of the testability of our applications and see how far afield that might take us (applications are rarely monolithic today, they have dependencies and other components that may or may not be obvious. Our testing environments should be set up and configured in a way that allows us the maximum understanding of its underpinnings. Doing so lets us get started with testing and receiving meaningful feedback from the application. Paying attention to these environments and periodically addressing the testability helps make sure that complacency doesn't come into play. Environments are not static, they grow and develop and the technologies that are good for one period of time may be inadequate later. Even at 30% complete, there is a lot of good information in this book. Is it worth purchasing as it currently is, with the idea that more will arrive over time? I say "yes". If the idea of helping your team develop a testability protocol sounds exciting and necessary, there is a lot to like in this book. Check it out!! !